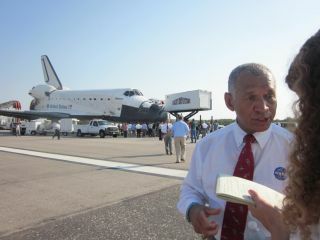 NASA chief Bolden speaks with a journalist on the runway with shuttle Atlantis in the background. NASA chief Charles Bolden will head to the hill Wednesday (March 7) to address the Senate about the status of the nation's space program. Bolden will speak in front of the U.S. Senate's Commerce, Science and Transportation committee about NASA's priorities, plans and progress. The hearing is scheduled for 10 a.m. EST (1500 GMT) in the Russell Senate Office Building in Washington, D.C.
Bolden will be joined by astrophysicist Neil deGrasse Tyson, director of the American Museum of Natural History's Hayden Planetarium in New York. Later on Wednesday, Bolden will visit the House Committe on Science, Space and Technology, where he will speak at a 2 p.m. EST (1900 GMT) hearing to discuss NASA's Fiscal Year 2013 budget outlook. NASA is weathering a tough transition after retiring its 30-year-old space shuttle program last year. The agency is now designing new space capsules to mount manned missions to an asteroid and Mars, while encouraging private companies to develop their own commercial spacecraft that could one day ferry American astronauts into space. Yet the current fiscal climate has put NASA under serious budget pressure, and the agency is trying to outsource flights to low-Earth orbit and the International Space Station to the private space sector. Under President Obama's 2013 budget request, NASA would receive about $17.7 billion next year, which is about $59 million less than the space agency's 2012 funding level. Wednesday's hearings will be telecast live on the Senate website and on the House website.